CJ loves her magnifying Glass. So we had fun playing/investigating with it. We missed this challenge. stamping/printing with different objects is a hit @ our household. So we will catch up later. We played our favorite tickle game. CJ sits in front of me showing her back. I trace a alphabet on her back with my finger and she has to guess the alphabet. We take turns. CJ traces the alphabet and I have to guess. It is a fun Sensory game. CJ calls it as tickling game. She starts giggling with the touch. We played with our Princess sensory tub. I set out a cardboard box. CJ's instant response "Mommy I'm going to make a card board story box like Pinky Dinky Doo". CJ loves Pinky Dinky Doo episodes. We found it via Netflix Streamline. Cj asked me to streamline the episode because of the pink words title. After watching few episodes she became fan of Pinky. Pinky is a 7-year-old girl, She and her younger brother, Tyler, discuss new words, concepts and use imagination and logic to answer some of life's questions. When a problem arises, Pinky says,"That gives me an idea" and Tyler says, "Pinky, are you going to make up a story?" and Pinky will say, "Yeserooni positooni!" and dances her way to a cardboard Story Box with Tyler and their pet Mr. Guinea Pig. Pinky uses a piece of chalk and her imagination to tell a story. Wanna know more, do visit the Pinky Dinky Doo website! They have a collection of games, videos and printables. CJ's favorite pretend play is "mommy and baby" game where CJ is the mommy and I'm her baby. So she got a mommy dress up. Mommy dress up--> Mommy's sun glass and a hand bag! We made a Birthday card(Party hat card) for CJ's teacher and Hand print cake cards for her School/class friends. CJ loves to take pictures. During thanksgiving sale, we were window shopping for a Tripod stand. CJ got so much inspired that she created the camera mounted on the tripod stand with the building blocks. The Role play was completely CJ's idea. She took the role of a photographer and we had to model for the pictures. If she was impressed with our pictures she gave us(the picture models) treats/toys. 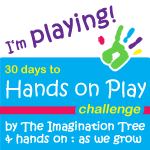 The challenge is from both - Hands on as we grow and Imagination tree, they have a detailed post on ways to keep on playing.